Posted on March 22, 2014 March 4, 2015 by Sarah R.
Many, many thanks to those wonderful FIMS students who created and participated in the joint CLA–SLA conference today, Humans of New Librarianship. I greatly enjoyed presenting my talk, “Human Traces: Searching for Signs of Intelligent Life in the Digital System” to this group of engaged future leaders of the field. 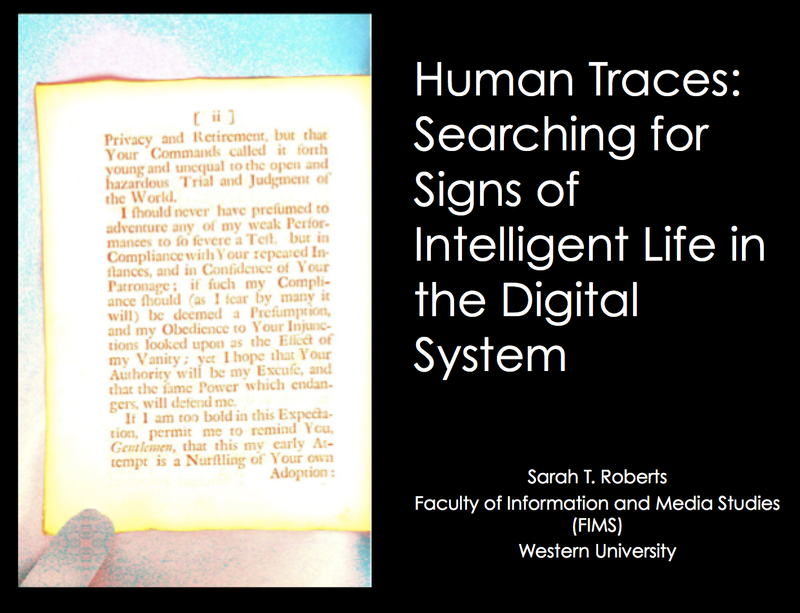 In this talk, I encouraged these students/future practitioners to seek out the human traces in the systems and platforms we all use, and to examine their embedded values. Additionally, we discussed the increasing encounters of the humanities with computation and STEM methods and technology, and the ways in which those conversations have, thus far, been largely uni-directional but would greatly benefit from a broadening of the interplay, with an expectation for and a valuing of participants to become as conversant in critical theory, feminism, cultural studies, etc., as in new technology applications for research. As scholars, we must seize and insist upon this. Give them tools to both interrogate and create. Identify and elucidate the landscape of the contemporary digital and networked world. Use new digital tools and platforms to (continue to) examine the cultural and historical aspects of pre-digital worlds. Preserve materials for study, analysis and archiving. Challenge, critique and apply a critical lens to new sites of inquiry. Create new tools, platforms and technologies that respond to our own epistemologies and critiques, that challenge paradigms, inspire and instruct. Finally, the clever students offer a “Bakerspace” where baked goods brought in by the students could be bedazzled with sprinkles, frosting and other caloric accoutrements. Well done, folks! It was an excellent conference! Thanks to all the participants!